The Treasury is asking to up the ante (to fight terrorism). They want banks around the world to track every transaction that goes in and out of the United States, not just those over $10,000. They want this policy to be approved and go into effect by 2012. They will data mine all that info for suspicious activity. Yep, here it comes. Capital control, step one: gather the info. Click here. You can’t control capital leaving the US, if you don’t know where it is. The Treasury Department will remedy this little detail. The likelihood that this will deter terrorism is nil. They will use the system they always used and (hint to the Treasury dept), it doesn’t use the traditional banking system. No, groovygirl believes this is to prepare for the mass exodus of money out of the US once the debasement of the dollar, confiscation of the retirement system, and increase taxes are truly realized by the rich and then the masses. If you want your money out of the US, do it before 2012. Your window of opportunity is closing fast. The unintended consequences of this policy are numerous. To start with, any international bank that is still doing business with the US after the Patriot Act, will discontinue business. There is just too much paperwork and nosing US agents to deal with. No international bank will want a US Citizen’s money, no matter how much money there might be at stake. International trade will slow to a crawl and currency wars will continue. If you are a US Citizen doing business internationally you will have trouble getting a bank account abroad, that is already happening. Groovygirl sees a niche industry of offshore banks becoming “holding banks” for US money coming in and out of the US. Most businesses in the East are skipping the whole dollar thing altogether, if they do not market directly in the US. Groovygirl is not suggesting that you get your money out of the US to avoid taxes, but because the dollar will be debased and the “terrorist laws” will just make privacy worse not better. Privacy, more of your financial information on more gov databases for hackers to break into. And, please, don’t think hackers can’t get into gov databases. They have in the past and they will in the future. Collapse of the US Dollar (it is hard to hold your cash in any other currency other than USDollars in the US, and the yuan is completely out of the question). Overnight “revalue” of the USDollar to 50% of its former value. Now that’s also a reason to have gold/silver outside the US. Collapse of the US banking system or extended bank holiday. Less liquidity restrictions. When capital controls kick in, you will be limited on the amounts you can take out/move over a period of time, because the banks are having liquidity issues, on holiday, looking for terrorist money, etc. There will be a mass exodus of the rich, move your money now and avoid the rush at the exits. Other countries not accepting US bills more than 3 years old because of massive international counterfeiting problems. Our only hope is that the government will be overwhelmed by paperwork and the computer data mine systems are years away from talking to each other. Right now, the purpose is to collect data (financial and communication) and the next step is to set up a system to organize it. Side musing: Here are Jesse’s charts from yesterday on gold and silver. Jesse mentions that Gartman called a top in gold. Gartman’s letter suggested to sell long gold positions. He said the same thing in April at $1200, when he stated the gov was comfortable with gold at $1200 (gov must be pretty uncomfortable right now with the high yesterday in early trading of $1314). He also said that US GDP would gain 3-4% this year. Google him. He has been doing his newsletter since 1987, I would feel better if he went back at least though the 70’s. Anyway, groovygirl is still in Martin Armstrong’s camp, where this current upward channel goes to $1750 and could trade down around $1150. It seems more realistic based on the macro-economic international stresses of late and the increasing currency wars. Gold is the ultimate winner in any global currency war and the smart investors know that. Groovygirl is not saying gold can’t go down, she expects volatility, but it is not overbought long-term. Maybe Gartman’s definition of long-term is 3 months? Time will tell. Jesse’s chart reflects his prediction of gold going to $1375 with a retracement and then onto $1455 based on the principles of the cup-and-handle formation that formed in 2010. This is in line with Mr. Armstrong’s recent letter entitled Gold. I found this over at Harvey Organ’s site. The cited reason for holding gold: The government decided to adopt the new approach mainly as the rate of return of gold in recent years has remained much higher than currency. KATHMANDU, Sept. 25 (Xinhua) — In a strategic move, Nepali government has decided to bolster gold reserve to back up macroeconomic stability and manage the market, after poor management of gold trade fueled balance of payment (BoP) deficit posing challenges to stability for about a year. According to Saturday’s Republica daily, Ministry of Finance (MoF) and Nepal Rastra Bank (NRB), the central bank of the country, have endorsed a new policy on gold, under which they have converged at maintaining separate reserve of monetary gold and 24 caret pure gold. “We will bolster reserve of monetary gold to back up currency and the additional 24 caret pure gold reserve will be maintained to intervene in the market in case of distortion,” said a highly placed source at MoF. Currently, NRB has over six tons of gold in its reserve. While five tons of the reserve is in Nepal, another 1.2 tons is deposited in Luxemburg against the interest return of 2 percent per annum. The interest is received in gold. “We have set a target to add three to four tons of yellow metal in the monetary gold reserve every year once we attain BoP surplus, ” said the source. What this means is, the policy has adopted a strategy to utilize the surplus BoP to procure gold. So far, the surplus is maintained in foreign currency. The government decided to adopt the new approach mainly as the rate of return of gold in recent years has remained much higher than currency. The government has currently banned the import of gold after it failed to re-impose higher import duty, which was necessary to plug the duty differences on gold between Nepal and India. But as that has created short supply, it has sparked illicit inflow of gold from India. Nepal’s gold import in 2009/10 had touched 41.63 billion Nepali rupees (some 570 million U.S. dollars) as substantial duty difference on gold between Nepal and India spurred smuggling from Nepal to India. KATHMANDU, Sept. 3 (Xinhua) — Nepali government has imposed a ban on gold imports to deal with the mounting pressure such imports been exerting on the country’s foreign currency reserves. A few good interviews on kingworldnews.com. Click here. I especially liked John Williams and Jim Rickards, part 1 and 2. Click here for part 8 in Chris Martenson’s series about what you should do to prepare. Side musing: stock market insiders are selling 1400 to 1, click here for zerohedge’s post. That is truly unbelievable. This looks like a liquidity run to groovygirl. Either insiders need cash for unreported capital calls or insiders know something we don’t and want cash. This is more than just profit taking before a stock market turn down, this is a desperate desire for liquidity. Very interesting that this occurs a week after the recent Fed’s minutes of QE2 by fall election time at the latest. Or is this a massive exodus to avoid those additional capital gains taxes in 2011? Anyway you slice it, something has spooked the rich in this country. Is gold approaching a bubble phase? Click here for a very interesting chart. This chart claims to give a visual representation of bubble psychology. In fact, it is really a chart of a standard bull market. For example, stocks from 1981-1999. Gold from 1960-1981. Real Estate from 1990-2007. 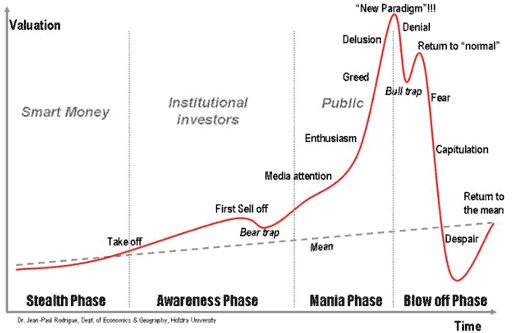 It’s all the same chart, the “bubble” part is the manic move at the very end, the delusion phase, just before the blow-off. You will notice that gold has passed the “bear trap”, but has not yet reached “media attention” in full. FOX seems to be the only major network talking about the recent record number of all-time highs in gold. All other networks just have gold experts on to ridicule them. And they can only talk if they don’t mention the real reason gold is skyrocketing….collapse in the confidence of fiat currencies and the systemic debasement of the USDollar by the government to avoid a default on debt. You have to be PC on TV and only mention gold as an investment class, not as a reflection of a failed fiat currency. So, gold is not in a bubble, it is right on schedule. For a timeline, precious metals bull markets usually last anywhere from 15-20 years. We are at least half way through. There is one other possibility, that the government will set the price of gold at some point in this bull market and work it into the new reserve currency and it will never go down. If they are smart, they will set the price at the delusional phase to best help them cover all the funny money they have printed. In this scenario you could choose to sell only part of your gold and hold on to the rest to sell later, as the price will not decline. If the government sets the price of gold and makes it part of the currency, it is possible that gold mining stocks will continue to go up, while the gold price remains fixed. Gold stocks out performing gold bullion is possible even in this regular bull market. Just some possibilities to think about. But for the time being…gold has along way to go. Here is another interesting chart comparing gold and silver to historical bubbles. Side musing: here is an excellent daily post from Jim Sinclair’s site. All of the items listed are very important news items. Click here for Martin Armstrong’s latest letter dated September 17, 2010, entitled, Gold, An 11-year High for 2010 (16 pages). Great letter, ladies and gentlemen. We are still right on schedule for this gold bull market. Kris mentions that the government is reviewing everything that goes out of the prison, so the Martin’s communication with the outside world has been very light. Martin addresses this issue on the last page. Gold is becoming a symbol of the resurrection of practical economics. Gold is a hedge against political instability and government default. Page 8 has a gold prediction chart. We are still in the first channel, and we will not break out of the first channel until at least $1750. The second channel represents a major global concern with government default and uncertainty in global markets. Martin says that gold at several thousand dollars is just a normal prediction of this gold bull market and it doesn’t even take into consideration hyperinflation (although Martin thinks hyperinflation is unlikely). As you know groovygirl disagrees, but could change her mind if the government got their act together. In groovygirl opinion, government will have to restructure all debt, reform current policy, and issue a new reserve currency all at the same time, and this will have to occur on a global scale. Groovygirl is not confident that government can pull this off, so gg is looking for a complete breakdown, that at some point will include a hyperinflationary event. The last 3.14 years of the bull market is when the price for gold explodes and does its major moves. Martin has not ruled out $10,000 and beyond for a top, but we are not near that point yet. “If gold were to rally up to $1480 in the last quarter of 2010, this would still not be a sharp phase transition.” To groovygirl this means that the government is still comfortable letting gold float up to this point, if the bulls push it. And we have a lot father to go in this bull market. Martin’s predictions (as in his 2009 letter) still do not call for a change to the second channel until after 2012. Martin reaffirms his thought that gold is not a hedge against inflation, but a protection against government who try to fiddle too much with their currency creating abilities and policies. Mike Maloney from goldsilver.com has an excellent snippet of video part one from his talk to banks in Russia. Click here. You know most of this, unfortunately, bankers do not, so Mike had to do some money creation 101 with them and how that system will turn on them in the near future. However, some other info may be new to you, like the contraction of the M3 and the predication of the fall in the price of oil (presumably because of the dollar currency collapse). Adrian Douglas has more proof of gold market manipulation. Click here. Another excellent post. Gold and silver manipulation doesn’t mean you shouldn’t invest in it. It means you should hold physical gold and silver outside of the Big Bullion banks hands in private vaults in your name. That way you will be protected when all this mess comes to light. Side musing: Chris Whalen talks about the house of cards that is the US banking system on kingworldnews. Click here. He also mentions groovygirl’s point a few days ago, banks committed fraud in court and on investors by not holding the note on these properties. Click here from my post. GG completely agrees with Chris, bank debt must be restructured to move forward. Another great interview on kingworldnews.com with Jim Rickards. Click here for full must-listen interview. Side musing: here is a link to several great audio interviews. I recommend Catherine Austin-Fitts, John Williams and Richard Daughty, but they all are probably good. James Turk has some predictions for short-term gold and silver. Click here. This is why you buy and hold in bull markets and never give up your position until the manic phase, otherwise you miss out on these types of moves. groovygirl: We are no where near the manic phase yet. Wait for it.